Birth of Agape, mixed media and gold on canvas. 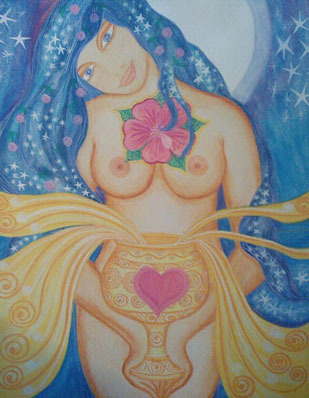 Roslyne Sophia Breillat paints mixed media works that depict the female body in its form of life giver and nurturer. These paintings, many of which represent figures of pregnant women embedded in nature just as a tree, flower or stream would be, can aid actual pregnant women in helping them to understand how their own bodies and pregnancies are powerfully connected to the natural world. Most of Breillat’s paintings are accompanied by simple poems that further describe women as givers of life and love. 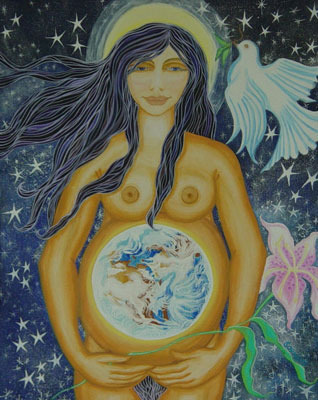 In her painting, Birth of Agape, the artist represents a pregnant woman whose body flows and becomes enmeshed with nature and the cosmos surrounding her. Stars from the sky blend with the strands of her dark hair, while a lotus flower opens across her thighs. In the center of the flower, a circular universe that mirrors the stars above crowns from the woman’s birth canal. Peaceful streams of violet, blue and white colors also stream from the lotus, blanketing the woman’s feet the way a swollen river would after rainfall. Misty white lines of milk also flow from the woman’s breasts while a soft heart rests towards her collar. She stares straight ahead with her face and mouth relaxed. Mystery of Gaia, mixed media on canvas. In this painting, the pregnant woman stands beneath the stars, a dove at her shoulder and a blossoming lilly in her hands. 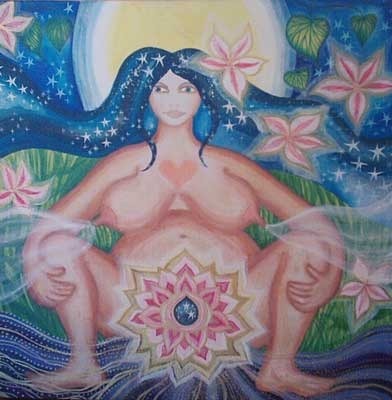 Her belly is full, appearing to contain the earth or a world within. Her eyelids droop and she is relaxed as she cradles her belly. Pregnant women can utilize this image by closing their own eyes and envisioning a soft, glowing ball that encompasses the babies within their own bellies. Chalice of Love, mixed media and gold on canvas. The artist has in this painting depicted a woman who carries a womb-shaped chalice embossed with a heart on it in front of her own womb. From the chalice flow curling streams of gold. The pink, white, blue and gold colors of this painting are soft. Pregnant women can utilize this image by imagining their wombs in two ways. First, they can envision their own wombs as full of love. Second, they can imagine their wombs as capable of opening up like the top of the chalice to release their babies into the world. Roslyne Sophia Breillat is an artist with a diverse background, including professional training and experience in art, design, illustration, writing, tarot, astrology, counseling and therapeutic skills, instructional skills and training program design. Working also as a teacher, Breillat has developed art courses and workshops for indigenous children, teenagers and adults. The artist may be reached via email at: sophia@wildheartwisdom.com or through her website: http://www.wildheartwisdom.com. I love these images! So powerful, calming, and joyous!